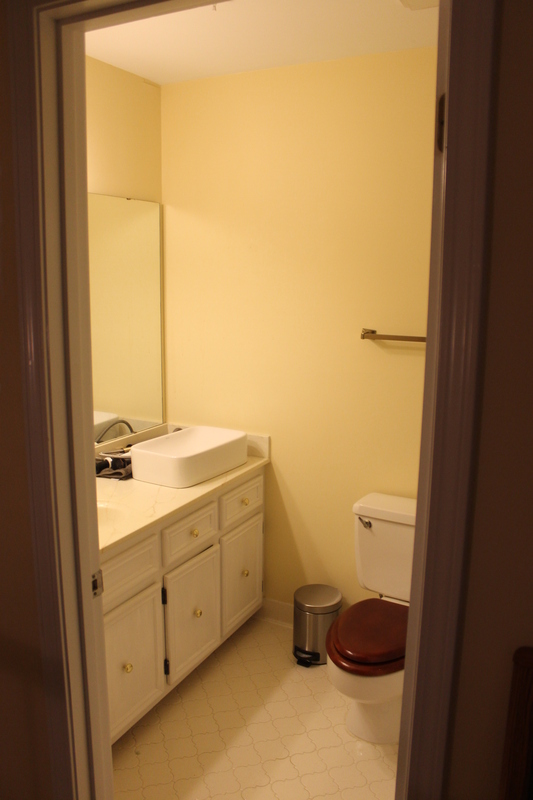 Of all of the bathrooms in the house, our bathroom is probably the worst. Oh and in case you’re wondering, “all of the bathrooms” = 2.5 bathrooms. 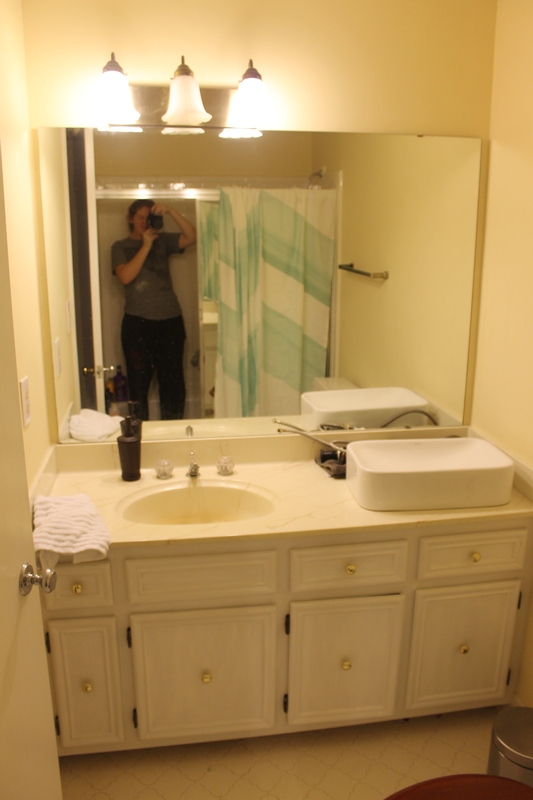 I would love to rip our bathroom down to the bare bones and make it all luxurious and what not but there’s this thing called a budget and it doesn’t allow for any huge projects right now. So, instead of renovating our master bathroom, we decided back in November that we would do a baby makeover on the guest bathroom which is rarely used but could still use some serious sprucing up. It’s also teeny tiny which makes it nearly impossible to photograph. Pretty, eh? We weren’t really sure where to go from here so the room sat like this for about 2 1/2 months until we found out that our good friends were coming to stay a weekend with us. I really didn’t want to greet them with a half wallpapered wall so we had to come up with another option which I will show you soon! If you follow me on instagram (@jmens6) you already know what we ended up doing here. The rest of the room was about as pretty as behind the sink. 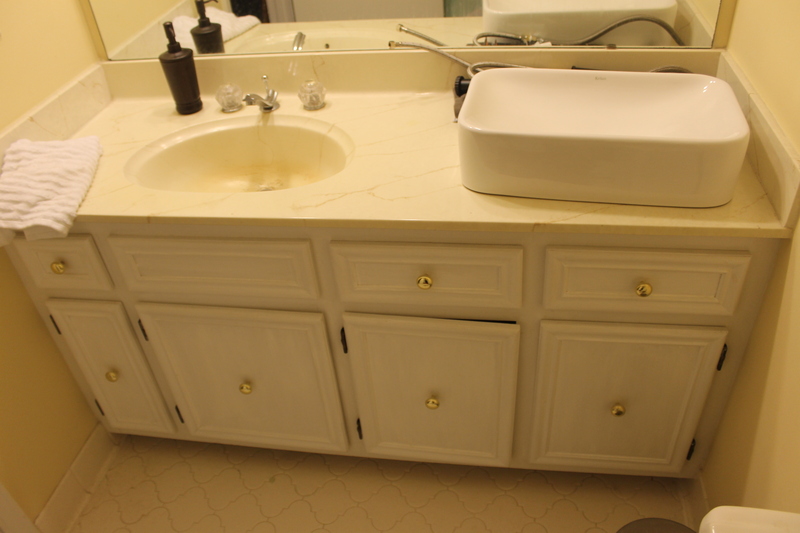 The sink/counter combo was old and cracked, the faucet wasn’t the prettiest thing I’ve ever seen, and the toilet seat and light fixture were both pretty outdated. The room also had the same yellow-beige that the rest of the house sported when we moved in. We’ve made a lot of progress in this room but we aren’t finished yet so that’s all you get for now. What? Doesn’t it take you two months to finish one project? No? Show off.